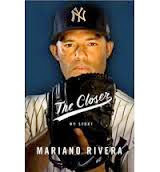 If you're a baseball fan, you surely know of Mariano Rivera, one of the best closers of all time who spent 19 years (!!!) with the Yankees. When the opportunity to read his autobiography came about, I jumped on it. Baseball is my favorite sport and I especially find athlete biographies to be interesting as I find they often have to overcome a lot of adversity. I found this book to be very intriguing, especially the beginning as Rivera described his home in Panama and how it came to be that he signed with the Yankees. He didn't really start out as a pitcher...he just sort of fell into it, but he was good, especially good with his command, and they signed him. But little anecdotes like how he was standing on the mound and could see his toe through his shoe made for an excellent description of where he came from vs. where he was heading. He moved through the farm system quickly enough and describes his first call up and how he was sent back down and it's a horrible feeling. Aw, it really made me feel for the prospects my own favorite team have this year who have gone through exactly that (and in both cases I really disagreed with them being sent down so ha). Even though this is a pretty normal thing in baseball that happens to many players. Also, his culture shock struggles mostly centered around language were interesting to read about. If you keep in mind that baseball players have 162 games a year and many foreign players are also dealing with language barriers etc...it just makes me want to take a really long nap to be honest! Rivera was part of the dominant Yankees team of the late 90s and describes that period and those games in detail. Any baseball enthusiast will enjoy this first hand account of so many pressure filled and important moments! Rivera is also a very devout Christian. He has experienced many miracles in his life--his son was healed in the womb, he gained an unexplained like 10mph velocity on his fastball during his career, he developed a cutter out of nowhere, etc. His deep faith sustains him through many things and really gives him a great attitude about so much. I feel he really comes across as a humble down to earth guy who just genuinely loves baseball. I love his little aside on PEDs and how those players desperately want to be at the top but are hurting the game instead, etc. A great read and any fan of the Yankees should definitely consider it, and I think any fan of baseball should as well! Or anyone that enjoys a good athlete biography! *I received a review copy.